LAKE TAHOE, NV – MontBleu Casino Resort and PR Entertainment, Inc presents New Zealand’s Music Award-Winning sensation, Sola Rosa, who will perform their amazing Reggae/Funk/Jazz/Latin/Hip-Hop Fusion, Saturday, December 3, 2011, inside Blu Nightclub at MontBleu Resort. Tickets are just $7.00, or $5.00 for locals and FREE for all local Ski Resort Employees, as MontBleu welcomes winter and all ski resort industry employees to the Lake Tahoe basin. Tickets are available at the door only. 9p doors. Must be 21. Acclaimed New Zealand combo SOLA ROSA will bring their groovaliciousblend of hip hop, reggae, jazz, Latin, soul and funk to lucky U.S. audiences for the first time this winter, via a series of tour dates just announced. Starting November 29th, frontman Andrew Spraggon will take the stage alongside Spikey Tee (Jah Wobble, Mr. Scruff, Bomb the Bass) and Lila Tomlins (Kiwi vocal sensation) for a Sound System tour of ten North American cities, beginning in New York, NY and ending in Ensenada, Mexico. SOLA ROSA is ready to prove to the U.S. audience that they have that special element it takes to make it in the ever-growing musical world. 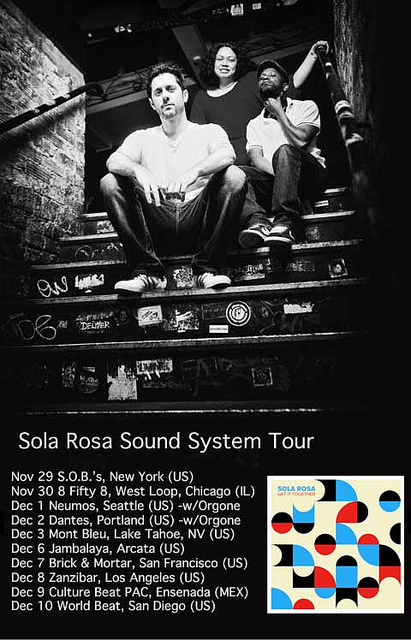 SOLA ROSA’s debut North American album, Get It Together, was recently released on October 11th, 2011, and already garnered a mention in the Village Voice, a single premiere for “Turn Around” in Baeble Music, and a video premiere for the same song on PopMatters. This is not surprising, as the album has stayed at #1 in NZ for over four months. SOLA ROSA frontman Andrew Spraggon ignores the niceties of genre boundaries and opts instead to blend his diverse influences into an otherworldly aural experience. Since 1999 he has been honing his craft by keeping good company on the road and in the studio, eventually earning himself a nomination for Best Producer at the Vodafone NZ Music Awards in 2006 and 2009. Get It Together was nominated for Best Electronica Album, and the album’s second single, ‘Turn Around’, was nominated for Best Video. While Sola Rosa’s first three albums undoubtedly cast Spraggon as one of New Zealand’s finest purveyors of downbeat-electronica – something that was backed up by a raft of accolades including a NZ Music Award for 2001’s Solarized, and b-net awards for 2000’s Entrance To Skyway and 2003’s Haunted Out-takes – his fourth long player, 2005s Moves On, saw a change in tact. Not content to simply stay within the bounds of any one genre, Spraggon expanded the Sola Rosa sound, incorporating more live instrumentation and adding a healthy dollop of funk, soul and reggae to an already considerablelist influences. The new direction not only reinvigorated the Rosa sound, but earned Spraggon another nomination for Best Dance/Electronic album at the 2006 NZ Music Awards. Despite the rapturous reception that all six of Sola Rosa’s releases have garnered, it’s Spraggon’s latest album, Get It Together, which has so successfully captured the breadth of his vision and piqued themost interest from record labels, artists and fans the world over. Like itspredecessor, Moves On, Get It Together builds on a more performance based template than Sola Rosa’ early work, featuring a full band. It’s also Sola Rosa’s most ambitious to date, something which can largely be attributed to the talented musical cast Spraggon surrounded himself with over the course of the album’s recording. Long-term Sola Rosa collaborators Matt Short (bass), Ben White (Guitar), and Will Scott (drums) were joined by vocalists Spikey Tee (best known for his work with Jah Wobble, Mr Scruff, and Bomb The Bass), UK MC Serocee, German-based poet and singer Bajka, and Wellington songstress Iva Lamkum. Beyond the outstanding vocal collaborations a bevy of New Zealand’s most talented musicians have lent their hand on the album as well – Julian Dyne, Scratch 22, James Duncan, Victoria Kelly and Miguel Fuentes to name a few. As a result, it’s no surprise that Get It Together has been so well received in New Zealand, chalking up the number one spot on iTunes and the Independent NZ Music Album Chart (where it stayed for four months), and reaching number 15 on the NZ Album Chart – all on the way to achieving Gold status. If that wasn’t enough, Spraggon was nominated for Best Producer at the 2009 Vodafone NZ Music Awards, Get It Together was nominated for Best Electronica Album, and the album’s second single, ‘Turn Around’, was nominated for Best Video. Perhaps most tellingly though, the success of Get It Together has spawned a remix album, Get It Together: The Remixes, which features thelikes The Nextmen, DJ Vadim, Yes King, TM Juke and J Star reworking Sola Rosa originals for maximum dance floor effect. Along with attracting a who’s who of international producers to remix the album, Get It Together’s heady mix of hybrid funk and tough beats has caught the attention of various labels throughout Europe. Lead single ‘Del Ray’ has been licensed for release through Sony BMG Germany for its Exotic Lounge Sessions compilation, and DJ Ease of Nightmares On Wax selected ‘Del Ray’ for his edition of Stereo Deluxe’s Coming Home series. This adds to an already impressive list of releases through revered global labels like Ministry Of Sound, Guidance, Different Drummer and Satellite K.
MEDIA: For High-Res Photos, interviews, or more information, please contact PR Entertainment, 310-374-9090, ext 200, or email, paul@prentertainment.net.